only to find her town hit by a devastating storm. In search of power, the evil fairy queen of Dreams has cast a terrible curse over all of Wish. With her father gravely ill and her mother missing, Lyra must find a way to break the spell. 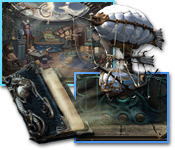 Journey through beautifully enchanted places, solve challenging puzzles, and seek answers to save Lyras hometown in ***Include_bigfishgames_text_dream_chronicles_5.shtml***! The Collector's Edition includes a bonus adventure that plays through what happened to Lyra's parents while she was gone, and a cliffhanger ending that sets the stage for the next game/story in the series. 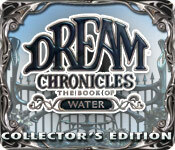 Dream Chronicles: The Book of Water uses quite a few scenes recycled from previous Dream Chronicles games, plus a few new ones that are so artistically similar to the previous games that it can feel like you've seen the place before. The Collector's Edition includes concept art wallpapers and other extras.